Mauricio Pochettino refused to entertain talk of a tactical battle with Ole Gunnar Solskjaer, although he felt Tottenham outplayed Manchester United in Sunday's 1-0 defeat. United took all three points from Wembley following Marcus Rashford's first-half goal, but Spurs passed up a series of chances after the break, with David de Gea forced to make 11 saves in the visiting goal. 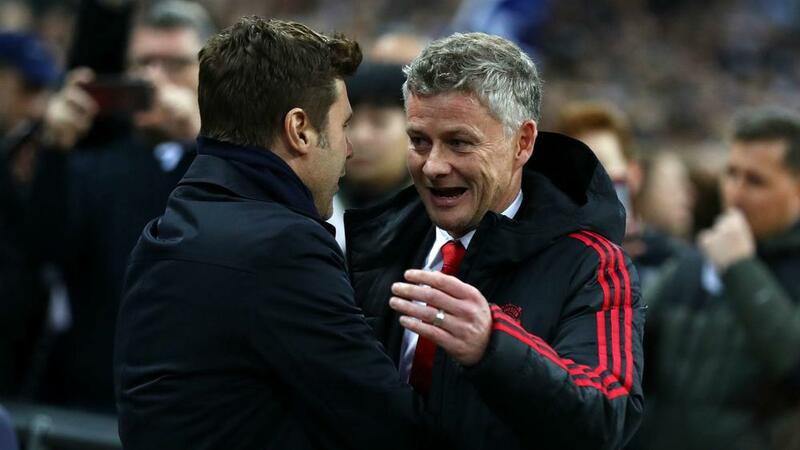 After talk in the build-up to the game that the match was an opportunity for Pochettino - linked to the United job - to take on interim Old Trafford boss Solskjaer, the Tottenham manager was asked how he felt he fared. But Pochettino insisted that the pair had overseen a "collective" battle and joked that he and Solskjaer would have had to take to the field for an individual duel. "It was Tottenham against Manchester United," he told his post-match news conference. "I'm not going to talk about [a battle with Solskjaer]. "I'm not going to judge his tactics. I think, in the plan you have to play, it's not ethical to talk about how he is doing or I am doing. You only can talk about the game. "Today, to talk about the game, of course we were better. We dominated the game and we created more chances than them. In the second half, we created 11 shots on target, with 11 saves from the goalkeeper. "It was a game and a battle between Tottenham and Manchester United, because if not, we would need to play him against me, one-versus-one on the pitch. Then the next game Fulham against [Claudio] Ranieri, then [Chelsea boss Maurizio] Sarri. "OK, come on. That is football and it's always about collective things." United have won five games from five in the Premier League since Solskjaer took over from Jose Mourinho, yet Pochettino would also not be drawn on improvement in the Red Devils ranks, despite recording a 3-0 win in the reverse fixture earlier this season. "To be honest, when we played there I thought they were very good and I cannot judge or talk about another period under Mourinho," he said. "I can only judge the performance of them [at Wembley]. "I think my feeling is completely different. I am happy after the defeat with the performance. I wasn't happy with the performance after we won 3-0 there."